CopyTrans.net offer again CopyTrans TuneSwift Activation Code for Free until March 15, 2011. 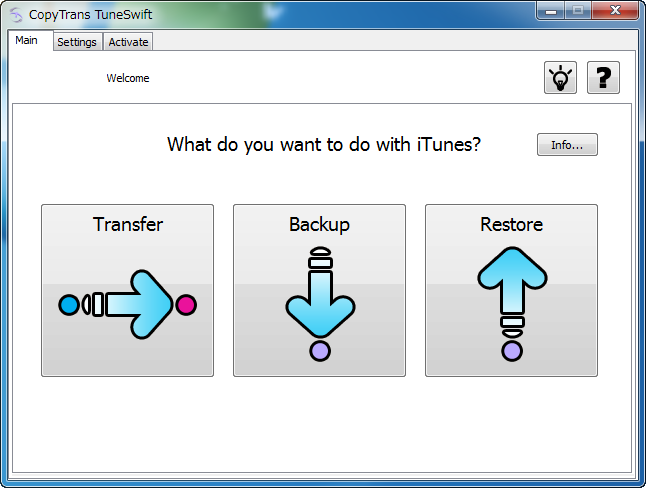 CopyTrans TuneSwift provides complete software to manage or move your iTunes library from one PC to another without iTunes software. CopyTrans TuneSwift is the easiest and safest way to move iTunes data (including iPod Touch, iPad and iPhone) to a Mac or PC without losing your iTunes library. Backup and save the latest changes of your iTunes library and Import the iTunes library from an external hard drive and restore it from previous backups anytime and anywhere. Back up the entire iTunes library. CopyTrans TuneSwift can backup iTunes library in your iPod, iPhone and iPad including music, videos, applications, books, purchases, artworks, playlists, and many more in a single archive. Open CopyTrans TuneSwift promo page here: http://www.copytrans.net. Download the software and install in your PC and copy the activation code to activate the software. You can get this software for free until March 13, 2011. Related to "Get CopyTrans TuneSwift Activation Code for Free"